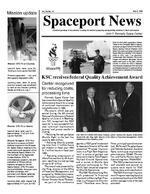 SPACEPORT NEWS Page 3 July 5, 1996 KSC employees will be given a preview of NASAs Mars exploration program during a pre-launch mission briefing July 8 at 9 a.m. in the Mission Briefing Room. Wayne Lee, mission planner for Mars Operations from the NASA Jet Propulsion Laboratory, will preview the Global Surveyor and Pathfinder missions scheduled for launch later this year. The Surveyor, scheduled to launch in November on a Delta II from Cape Canaveral Air Station, will begin the most comprehensive orbital study of any planet in the history of space exploration. The Pathfinder, slated for a December launch from CCAS, is designed to crash land on the Mars surface and deploy a microrover to collect data. NASA scientists hope that the study of Mars can provide insight into the formation and evolution of Earth and the inner solar system. Briefing gives Mars preview This collaboration between GAI and NASA brings together two organizations respected in this field of study and should benefit the public with an extremely solid new product, said Pat Zumbusch, GAI president. The two-year agreement assigns responsibilities to both parties. GAI will focus on improving the location accuracy, small signal detection, and flexibility of NASAs existing system. After reducing the cost of transmitting and displaying data, a commercial version of the system will be available. NASA will operate the LDAR system, allowing GAI to compare it to newly developed systems. NASA will also assist GAI with the design and evaluation of system components and allow the company to use existing equipment, facilities and weather data. This agreement is the perfect example of NASA working together with industry to bring space age technology down to earth, said Bill Sheehan, KSCs Technology Programs and Commercialization Office. Current two-dimensional commercial systems only locate cloud-to-ground lightning. NASAs three-dimensional LDAR system also pinpoints the location and altitude of in-cloud and cloud-to-cloud lightning by measuring the exact arrival times of electromagnetic pulses. When you hear a crackle of lightning over your radio, you are listening to an electromagnetic pulse. Since the speed of light is constant, once we know the time of a pulse we can figure out exactly how far away the lightning is, explained Carl Lennon, KSC Information Systems Division. The system detects the VHF or very high frequency radiation and maps the volume of the lightning activity. The result is a three-dimensional presentation of the local activity and the threat that it presents. GAI designs, manufactures and markets commercial lightning detection systems used worldwide for collection, analysis, display and dissemination of lightning related information. They bring the expertise and resources to this partnership that are necessary to expedite commercialization. Since 1992, a NASAdeveloped Lightning Detection and Ranging (LDAR) system has provided a safe, productive work environment at the Kennedy Space Center (KSC) and the Eastern Range, which are located in the most lightning intensive area in the United States. Now private industry and the public stand to benefit from the technology. NASA has signed a Space Act Agreement with Global Atmospherics, Inc. (GAI) of Tucson, AZ, to begin joint work on development of an LDAR system that meets both NASA and commercial needs. The technology has commercial application in the electric utility, aviation, atmospheric research, commercial rocket launch, recreation, construction and meteorological industries. The 45th Weather Squadron at Cape Canaveral Air Station uses LDAR to accurately inform KSC of any lightning threats in the area, said John Madura, manager of KSCs weather office. Cape Canaveral Air Station and the National Weather Service in Melbourne, are the only organizations currently using this system. Spacewalk to commemorate contributions to space program NASA, industry to work together on lightning detection A nyone who has contributed to the success of the space program now has the opportunity to make a lasting impression of that effort while contributing toward future space endeavors. The Astronauts Memorial Foundation and the NASA Alumni League, Florida chapter, are jointly sponsoring the Spacewalk of Honor at the KSC Visitors Center. The walkway, which will encircle the west pond located between the Center for Space Education and the Space Mirror Memorial at the Visitors Center, will be paved with 22,000 bricks, each inscribed with the name of an individual who has played an active role in the space program. Anyone interested in purchasing a brick will be asked to submit a statement of up to 50 words describing his or her relationship to the space program. The statement, along with the persons name and the location of their brick, will be available at a computerized information kiosk located near the Spacewalk. Each honoree will also receive a personalized and numbered certificate suitable for framing. P urchase price of the bricks is $75 which will go to the Astronauts Memorial Foundation to create an endowment fund to support the Center for Space Education, and to the alumni league for aerospace scholarships. The project should take about a year to complete, said Jim De Santis, president of AMF. Several of the bricks are already in place, including those honoring the crew of Apollo 13. Applications for purchasing the bricks are available at the KSC Visitors Center, at Brevard County First Union and Barnett banks, or by calling the toll-free number 888-99SPACE. A BRICK pathway is taking shape near the Center for Space Education at the KSC Visitors Center. John F. Kennedy Space Center Spaceport News The Spaceport News is an official publication of the Kennedy Space Center and is published on alternate Fridays by the Public Affairs Office in the interest of KSC civil service and contractor employees. Contributions are welcome and should be submitted two weeks before publication to the Media Services Branch, PA-MSB. E-mail submissions can be sent to Barbara.Compton-1@kmail.ksc.nasa.gov Managing editor. . . . . . . . . . . . . . . . . . Lisa Malone Editor. . . . . . . . . . . . . . . . . . . . . .Barb Compton Editorial support provided by Sherikon Space Systems Inc. writers group. USGPO: 733-096/20024 SPACEPORT NEWS July 5, 199 6 Page 4 The work of the Kennedy Space Center has been acknowledged around the world but now, thanks to e-mail set up on the Mir space station, it is being recognized from space. Astronaut Shannon Lucid, who has resided on the Mir since March, and is scheduled to return aboard STS-79 in August, used her e-mail June 12 to respond to a message she received from Mike McCulley, vice president and associate program manger, ground operations, for United Space Alliance. McCulley had written: Dear Shannon: I listened very carefully when you instructed us to make sure 79 was on time. The flow is going well and we at KSC and United Space Alliance (formerly Lockheed Martin) are all proud of you and the two Yuris. By the way, Gallileo continues to perform well. Good luck, Mike Lucids response reflected on the work being done at KSC to prepare the Space Shuttle Atlantis for that return flight. Mike, Thanks for the note!!! My definition of happiness has changed or maybe I should say expanded!!! In addition to an empty payload bay, happiness is looking down at Florida from the station Mir and almost seeing all those great Atlantis folks going about their daily tasks in such an enthusiastic and professional manner!!!!! Shannon KSC collects kudos from space SHANNON LUCID joins in an inventory of food supplies on the Mir space station shortly after her arrival there in March. Yuriy Onufriyenko, Mir 21 mission commander, is at left and Yuriy Usachov, flight engineer, is on the right. Children try on KSC for size SEVERAL BOYS visiting Kennedy Space Center on Sons' Day June 14 enjoy the perspective normally seen by presenters at the Press Auditorium. From the left are Billy Browning, Johnny Diamantas, Michael Allbright, Jesse Seelos, Jesse Williams, Kyle Diamantas and Lamar Evans. They are accompanied on their tour by Cindy Oates and David Zorn of United Space Alliance. MORE THAN 1,500 children took part in Sons' Day events. Andrew Bernardo, pictured at right with his father Phil, a NASA employee, had the opportunity to try on an astronaut suit in the Operations and Checkout Building. After being welcomed by Center Director Jay Honeycutt, NASA participants heard astronaut candidate Frank Caldeiro speak and took part in a presentation by Steve Van Meter of KSC's robotics laboratory. An unexpected bonus was the surprise visit by four crew members from the upcoming Mir docking mission STS79. The event, which included many girls as some contractors held a combined "Take Our Children to Work" activity, was successful because of the cooperation between NASA, contractors, the KSC Visitors Center, and Delaware North Parks Service, said Barbara Powell, event coordinator. NASA ADMINISTRATOR Dan Goldin is among several special guests getting an upclose view of the launch of STS-78 June 20 at the Banana Creek viewing site. Oh say can you see?